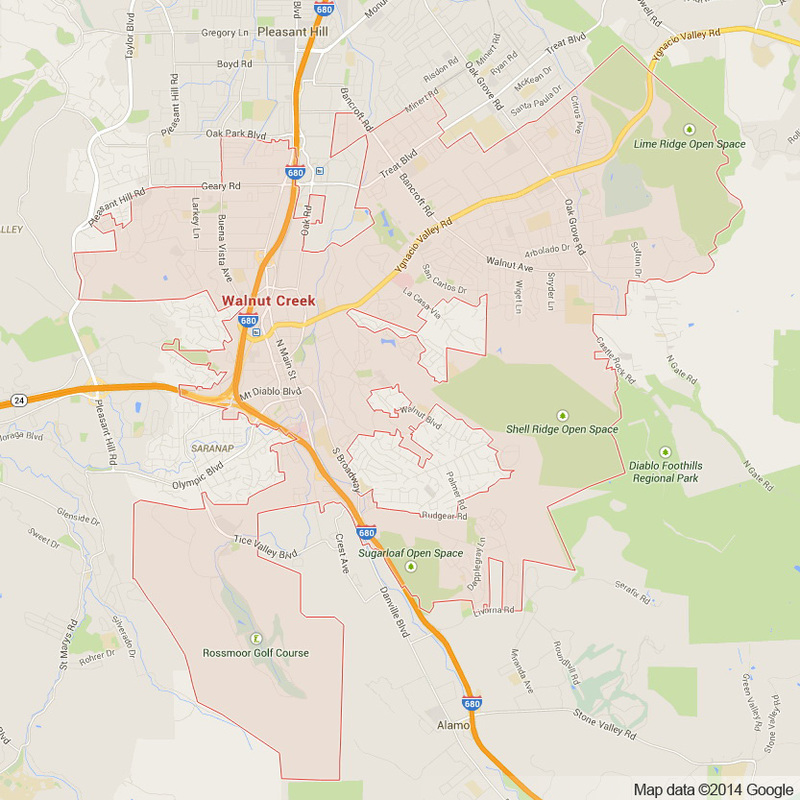 Pristinely located in the East Bay Area is the exclusive enclave of Walnut Creek. This community of slightly over 60,000 people sits beautifully at the base of the Bay Area’s most majestic mountain Mt. Diablo. The surrounding foothills and incredible paths that swerve throughout them give Walnut Creek an incredible country feel to compliment it’s proximity to the major urban center of the Bay Area. With Oakland and San Francisco only a few miles away, Walnut Creek truly embodies the best of both worlds – serene nature and a bustling Bay Area downtown . Mt. Diablo is complimented with an unprecedented amount of open space perfect for exploring and finding beautiful vantage points where it is possible to see nearly the entire East Bay. Walnut Creek also boasts and number of parks including Civic Park in the middle of downtown or Borges Ranch, the more historically inclined recreational park area. The downtown of Walnut Creek is home to some of the Bay Area’s best restaurants and shopping destinations. Broadway Plaza is home to a number of amazing shops from the most unique boutiques to upscale chain stores such as Neiman Marcus. Plenty of incredible restaurants of all different cuisines with premier chefs developing the menus, make Walnut Creek a top Bay Area destination for incredible dining. Walnut Creek is also home to a number of great bars perfect for anyone looking to have a fun night out on the town. For those who like to enjoy live theatrical performances the Dean Lesher Center of the Arts in the heart of downtown Walnut Creek is renowned for hosting the best live theater in the East Bay. Whether you are a long time resident of Walnut Creek or visiting this incredible Bay Area destination Apex Limousine Transportation is here to help. We specialize in luxury limousine transportation for any and all occasions. As Walnut Creek’s number one limousine transportation service, we pride ourselves in our consistency in providing our Walnut Creek client base with the best limousine transportation there is. While we offer a wide range of limousine services one of our specialties is wedding day services. Our knowledgeable staff works directly with the couple, families and wedding planners to ensure that the limousine transportation component of your wedding day is flawless. We always go the extra mile to ensure that your special day is as perfect as it can be. Our fleet of state of the art vehicles with upgraded interiors help add the extra bit of luxury to your already incredible wedding day. We also specialize in providing residents of Walnut Creek Napa Valley Limousine Winery Tours. Our limousine transportation tours are the most comprehensive in the region. Our staff begin by helping you and your party develop an itinerary. If you are a Napa Valley veteran and know exactly where you want to go, our limousine drivers will follow your plan and go exactly where you want to go. There is no extra charge for more than one stop so our limo driver will take you to the exact restaurants and wineries your heart desires. If you are looking to do something extra special and want to explore the incredible bounty of the wine country for the first time our staff will, free of charge, develop a customized itinerary for you and your party based of your preferences. Our deep knowledge and experience in the region combined with your specific tastes and interests help us develop a unique and customized Napa Valley experience that you will never forget. Our limousine drivers are as professional as they are experienced and always make the experience smooth and timely. Our fleet of vehicles to choose from can compliment any sized party. We have a beautiful and modern fleet of sedans, SUVs and limousines to choose from all of which are subject to consistent safety checks and interior refurbishment that heighten the experience. For those who are traveling elsewhere or making Walnut Creek their base in the exploration of the greater Bay Area, we also proudly offer sedan and SUV airport transportation services. We provide pick ups and drop offs to any of the major Bay Area airports including SJC, OAK and SFO. We coordinate directly with you on specific details to ensure timeliness and promptness when providing our limousine services to you. We know how stressful traveling can be, so our services help make the experience as relaxing as can be. For other occasions such as junior prom, senior ball, birthday parties, nights out on the town in San Francisco or Oakland, sporting events or concerts, Apex Limousine Transportation is the perfect choice. We guarantee that when you ride with Apex Limousine Transportation you are not just going from one place to another – you are having an experience you will never forget. So join us today and together we can go anywhere and everywhere in luxury. Please call us for car service all inclusive total for Walnut Creek to/from Napa Valley transfer.